Home CGDA CGDA Order : Payment of Salary/Pension with NPB 28th May 2018 in view of Bank Strike on 30th & 31st May 2018. 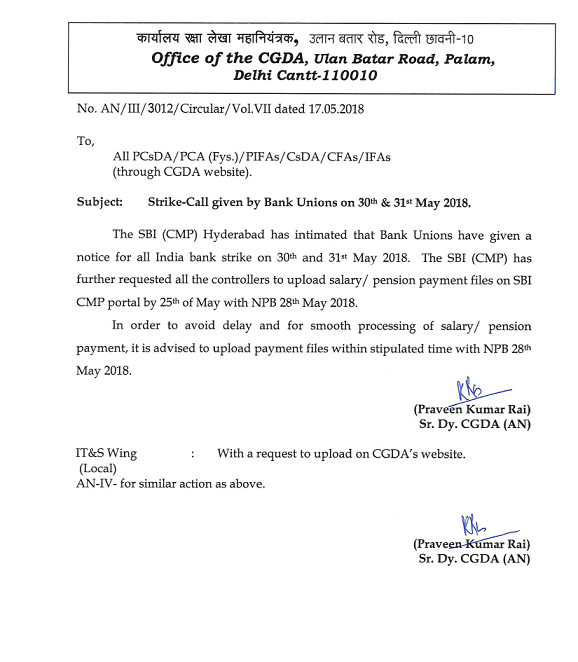 CGDA Order : Payment of Salary/Pension with NPB 28th May 2018 in view of Bank Strike on 30th & 31st May 2018. In order to avoid delay and for smooth processing of salary/ pension payment, it is advised to upload payment files within stipulated time with NPB 28th May 2018.